In case you plan on being productive with your long weekend and tackling some paint projects, here are a few tips for you! 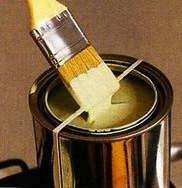 Place a rubber band around your paint can to help rid the brush of excess paint. This also helps keep the rim clean making for much easier cleanup. 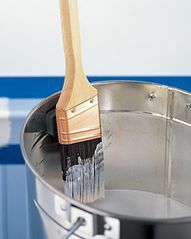 You can also attach a heavy duty magnet to the brush to minimize the mess of dripping paint. Again, less mess to cleanup! 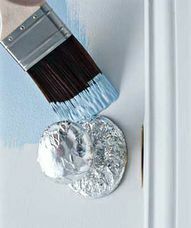 If door knobs are in your way, just wrap them tightly in foil and go! Paint wood chips from the craft store in your room's colors. Throw them in your purse so you'll have them for reference when shopping for fabric, accessories, etc. -When you're done with the brushes and rollers for the day, but not quite finished with the job, wrap them up in cellophane and place in the refrigerator overnight. No cleaning--and you'll be able to pull them out and get right back to work the next day. -Frog tape is the best-don't be fooled by the blue painter's tape. -Buy good brushes. I prefer Purdy. A good brush makes all the difference. -Buy a short-handled angled brush for cutting in. -Always keep a damp washcloth around for quickly wiping up mistakes. -Use a drop cloth! It's worth it to save your carpet. -Paint barefoot. That way you know if you accidentally set in paint and won't be trekking it around the house unknowingly.